Every now and then we really try to use everything we have in the freezer before buying anything new. We get all geared up and inventory what is inside and then make some recipe plans to be used with what we discover. Tonight we were using up some homemade cambridgeshire sausage. The idea of a sausage casserole was not terribly exciting to me, the non-sausage lover in the house (except for Lincolnshire sausages…those I love). 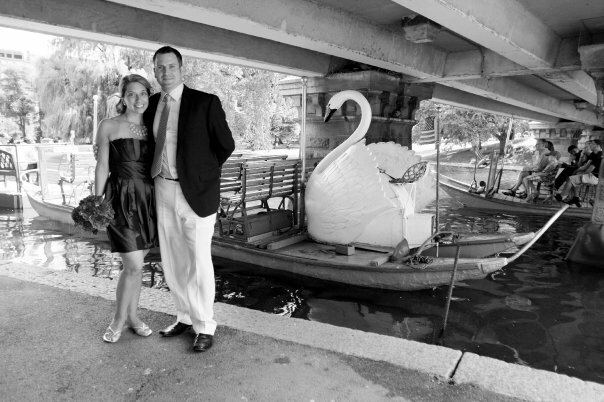 I knew everyone else would love it…but did not have any expectations for myself other than taking a few bites to fend off that evening hunger that would set in around 5 or 6. I should be smarter by now, really. Because what we think will be one of our average dinners usually turns out to be one of our favorites. 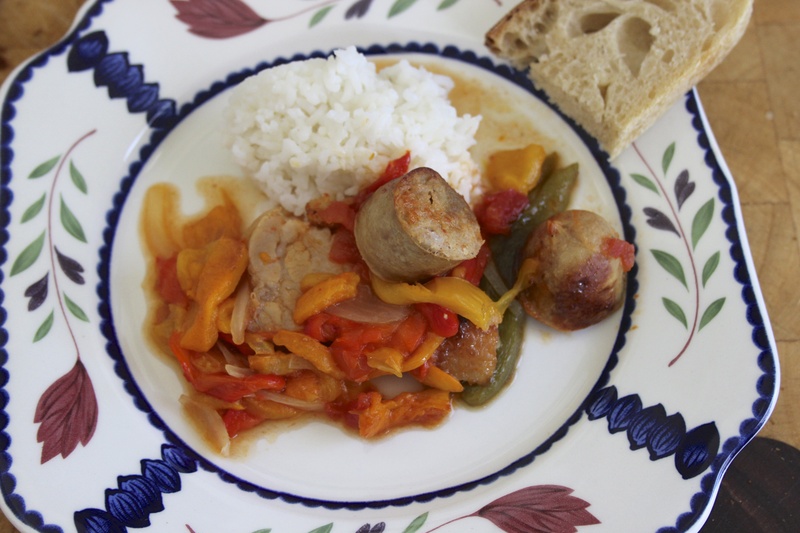 This sausage & sweet pepper casserole was no different. We paired this with peppers and began by drizzling them with olive oil and kosher salt. They were then roasted in a 400 f. oven. 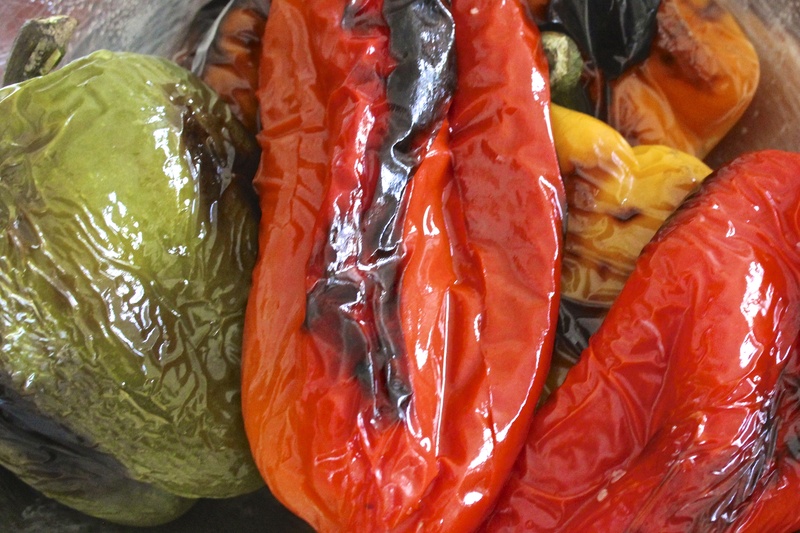 Once the peppers had a nice char from the oven, we placed them in a bowl and covered with plastic wrap. We let them steam for a good 10 to 15 minutes and then the skins pulled away from the sweet flesh of the pepper. We julienned the peppers and set to one side. In a pan we browned the sausages on all sides then removed them to rest. Once rested, we cut into bite size chunks. We had a little left over pork belly (bacon or pancetta would also work well) which we sliced and browned over a gentle heat and rendered some of the fat. We placed the sausage and belly into a casserole and then added sliced onion, crushed garlic, the peppers (and any of the pepper juice), one tin of chopped tomatoes, one bay leaf, two tablespoons of tomato puree a splash of sherry vinegar and some salt & pepper. We placed the casserole in a 350f oven and cooked covered for about 25 mins before removing the cover and cooking for an additional 10 mins. 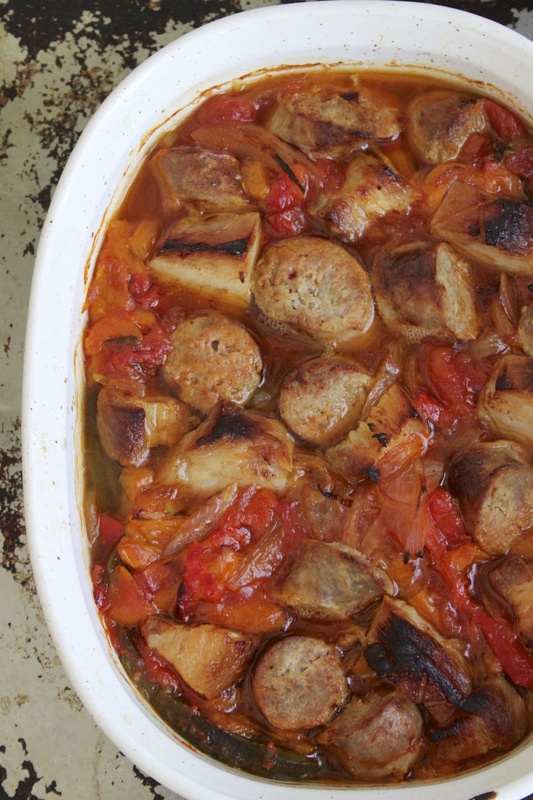 We learned that this sausage casserole is a favorite with our children. If it is just for adults then you can always spice it up a little with some hot sauce and a few chili peppers. We served this with rice which we cooked in our pressure cooker. Yeah, so with the addition of pork belly, healthy this might not have been….but delicious…yes. We really didn’t expect the flavors to be as incredible as they were. 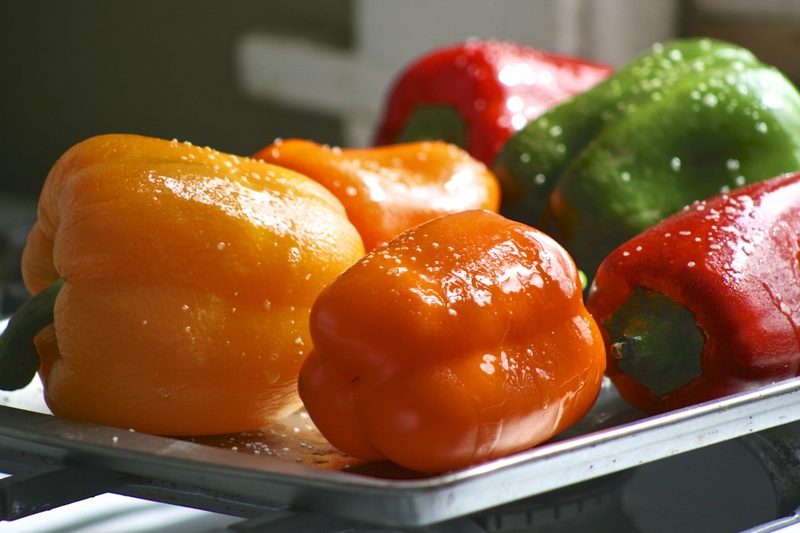 The peppers were so sweet and yet had that depth of flavor and complexity they can get when they are roasted and charred. We couldn’t get enough of them. We did manage to save some aside and let me tell you- the next night they were the best atop a cracker spread with goat cheese. Oh my goodness. So fabulous! A cracker accompaniment we don’t always think of but will keep in mind for the future. For me, they were the best part of this meal.